What's best for MX? 505sx or 540xc? Thread: What's best for MX? 505sx or 540xc? Hey there, I've been racing mx for a couple of years on my 505sx. It has stock suspension, precision damper, hmf slip on, fuel customs intake, fourwerx seat, flex bars, beadlocks all round etc. 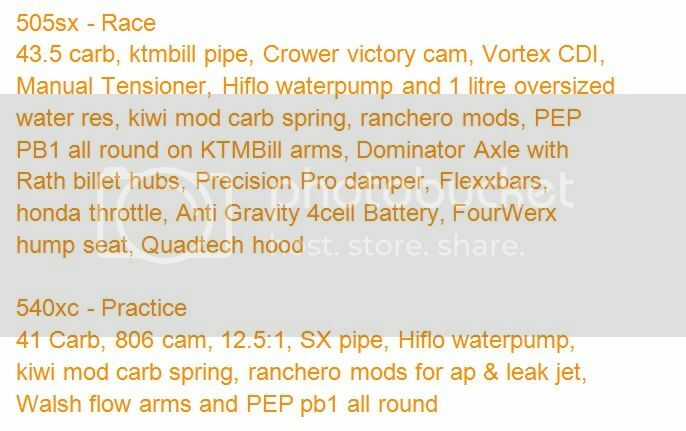 A 540xc has recently came up forsale with Walsh mx arms, fox float 3, precision damper, full fmf, flex bars, oil cooler etc and with beadlocks all round for a really good price. I'm wondering should I buy this other quad and borrow a few bits to make my SX better, such as the suspension, or would the XC be a better bike?! Sx for mx every time. You'd be better spending the money on new suspension for the sx designed just for you. So is that because of the high revenge motor and torque high end? Where as the XC motor is more low down grunt ? Xc are superb at pulling through the gears at lower revs, the demand of mx racing does not suit the xc - high revs kills them. Oh hey mate, we've already chatted on Instagram. I go by the name of Dirt_boss_bullock. I have a 525xc and 505sx. I love them both but the sx is definitely the better mx'er. The engine revs out quickly and to the moon, and it hugs corners like it is on rails. The xc has more low end torque that is better for trails, hills, and generally slower riding. The xc can be modded to accelerate quickly to 3/4 throttle, but once you get into the upper range it doesn't like it as much as the sx.